starring Ralph Fiennes, Tilda Swinton, Willem Defoe, Bill Murray, Jason Schwartzman, Jude Law, Adrien Brody, Tony Revolori and many more. Wes Anderson's films are delightful to watch. I enjoy the way the narrative gets broken into parts and the two dimensional feel of some of the backgrounds. It feels like a fantastically orchestrated play. 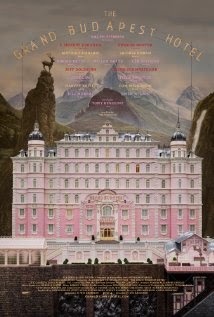 In The Grand Budapest Hotel, we learn the story of this established hotel and how murder, love, loss, and delicious baked goods cross paths and connect the many colorful characters in this world. The story is a story within a story. The narrator is an author who is recounting an occasion spent at the Grand Budapest Hotel and how he came to meet the owner of the establishment, who tells him the story of how he came to own the hotel and how it had fallen from it's former glory. The main character in that story is M. Gustave, the concierge. He seems to be the very heart of the hotel, making sure it all runs smoothly. He meets a new Lobby Boy named Zero. And the two of them grow to become good friends. One day, a very wealthy patron of the hotel is found dead. Murder is suspected and the number one suspect is M. Gustave who then pays his respects to the deceased and proceeds to steal an incredibly expensive painting that was being left to him in the deceased's will. Why steal a painting that is now technically his? Well, because he is a suspect in her murder and that would probably be the only time he would ever get a chance to be anywhere near the painting what with the greedy heir that hates his guts taking ownership of the home. The painting is the only valuable thing in the entire house, so the rest of the film has to do with M. Gustave hiding the painting, the greedy son trying to find the painting with the help of a cruel thug, and M. Gustave running from the law. There's a lot that happens but the pacing is quick and not only is the film beautiful and fun to look at, but it's funny too. I won't say much about the scene with the cat but it was a shocker and had I seen some of the previews that are currently playing for the film before I actually saw the film, I'm not sure that scene would have had the same effect on me. Ralph Fiennes is a wonderfully versatile actor. His performance was great. I also thoroughly enjoyed Tilda Swinton and I thought the make-up on her was so superb. Willem Defoe plays a fantastic villain and I liked Tony Revolori who played the younger version of Zero, too. He and Ralph's characters were great together running about, riding sleds, riding trains, and all around having each other's backs. I actually liked every single character in the film as I think they each added something special to it. It's kind of a sad film, too, when I think about it especially in regards to how the characters lose loved ones. Especially in the case of Zero... But, he finds poetry in life, he holds onto great memories, and shows great strength of spirit in the end. This is a great film, now go out and see it for yourself!